Pie for Py on Pi Day! Not too long ago the oldest pea helped me pull off a surprise night for Phoebe who had been missing Pizza Planet at Disney World. (See that here https://momof2peas.com/2013/05/21/i-want-to-go-to-pizza-planet-mommy/ ). So for Pyper who we call Py, Phoebe and I wanted to surprise her with a special dinner too and what a better chance for this house of self proclaimed nerds than Pi Day! Knowing how picky the girls are we knew Py would love a broccoli, chicken and cheese pot pie. I looked for recipes on line and Pinterest of course. Like always nothing looked right so I looked at a few and just made my own and hoped it would work! Starting off with chicken breast …. While the chicken cooked, I steamed the broccoli …..
Shredded Cheddar, two bags one mild one sharp, 2 cans of cream of broccoli, and two bags of frozen broccoli and a cup of milk. Once all of the ingredients were mixed together we put it in a already made pie crust…I didn’t have time to try and make homemade but I will try some day! This was the part she was waiting for filling the pies. She did this herself too! I did flatten the tops a bit to add the top of the crust. 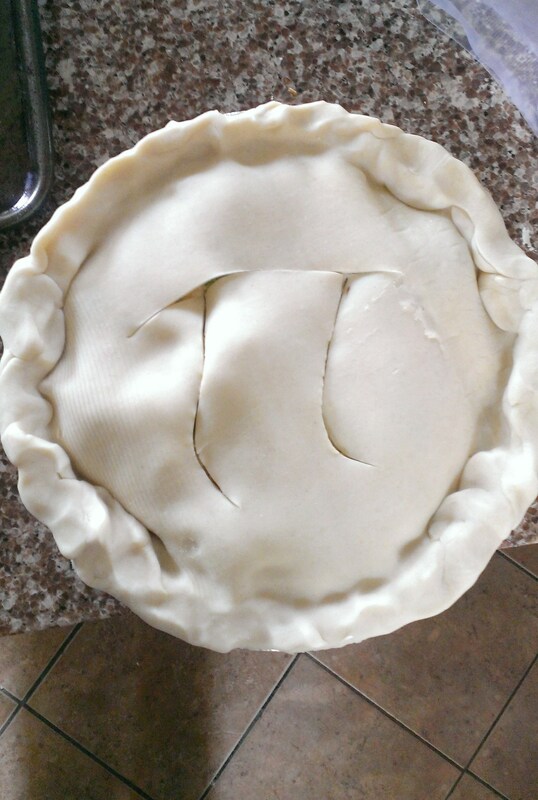 Once we got the top crust on I cut the Pi sign on top . She was pretty excited and the whole family loved the pot pie! So we had to top it off with more PIE! This recipe will make two deep dish pies (-: and is very cheesy next time we will use only mild cheese too the girls loved it but thought it was rich. We will just keep trying I can’t wait to cook with the peas again!